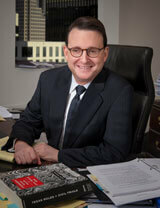 Seymour Roberts, Jr. began practicing law in 1986, and joined Neligan LLP in 2008. He is a Partner, with an AV rating, in the Firm’s Reorganization/Corporate Finance practice group. Roberts has also attained the designation of Advocate with the National Institute of Trial Advocacy. His concentration is in the areas of corporate reorganizations and workouts for debtors, creditors, committees and trustees. As an experienced Receiver, Roberts concentrates in multi-family housing appointments. As a bankruptcy attorney, Roberts appreciates the opportunity to make a positive difference in people’s lives by helping businesses succeed, which can preserve jobs and impact lives in important ways. Roberts is committed to standing by his clients, and adhering to ethical business practices. Since joining the firm, he has represented the interests of debtors, creditors, committees and trustees in large and complex reorganization and liquidation cases. He has also written numerous professional articles, which have been published in the Annual Survey of Bankruptcy Law, American Bankruptcy Institute Journal, Executive Legal Advisor, Texas Lawyer, and other publications.